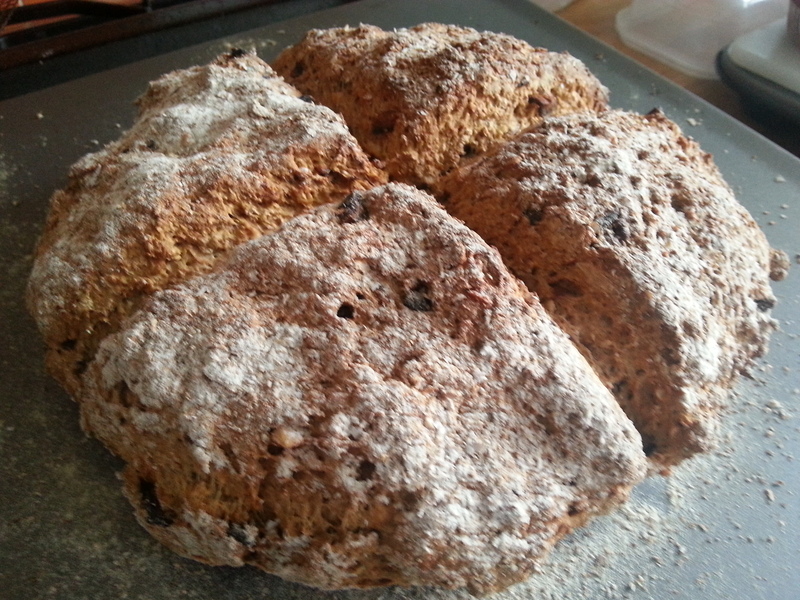 Irish Soda bread is one of the easiest and quickest bread to make. I have a basic recipe that I follow but play with the flour mixture from time to time and often add some seeds to the mixture for a different texture. The only thing with this bread is that you need to use it up fairly quickly as it do not keep very well but if you are anything like our household you might struggle to resist it once it comes out of the oven. Its good with a nice bowl of soup, with a hearty Irish Stew, with dips like Houmous and my wife loves it with butter and strawberry jam (as many do in Ireland). Preheat the oven to 200 degrees centigrade. In a large bowl mix together all the dry ingredients. Now add the buttermilk and form a dough. Sometimes I have had to use a bit more flour at this stage to help form a dough. Whatever you do try and keep the whole process quick as as soon as the Soda comes in contact with the liquid it starts releasing CO2 which helps the bread to rise. Pour it over a floured surface and knead lightly in to a slightly firmer shape. Form a round shape and flatten slightly. Sprinkle a few more seed mix on top. Put it on a lightly floured Baking Sheet. Using a sharp knife make two incisions as a cross going almost all the way down. Dust lightly with some flour and bake for about 30 mins or so (till the bread sounds hollow when tapped). Cool on a wire rack. As said before this is best eaten on the day or the next.